Since we are going away this weekend and my son is still dairy free, I thought I would load up on some good snacks to make sure he has enough to eat. I came through with an even better gluten free muffin today than the ones I have made in the past, and this one is dairy free too! He ate 2 this afternoon for snack, and asked for a 3rd (I said no! ), so they are definitely kid approved. You might notice that they have similar ingredients to my pancakes, but hey, we got a lot of overripe bananas hanging around here, and I’m just loving coconut oil and chia seeds lately. This is a great recipe to have the kids help with, there is lots of measuring and stirring, and you really can’t mess it up. My son helped me make them and even ate plain chia seeds and loved them!! Hope everyone has a wonderful and safe holiday weekend! Preheat the oven to 400 degrees. Mix coconut oil, milk, eggs, applesauce, bananas, and vanilla extract in a large bowl. Make sure the milk is not too cold to avoid the coconut oil clumping up. Whisk until well combined. Add the oats and chia seeds and set aside for about 15 minutes. Mix the rest of the ingredients except chocolate chips in a separate bowl and whisk to remove any lumps. Pour the dry ingredients into the wet and mix until just combined. Stir in chocolate chips. 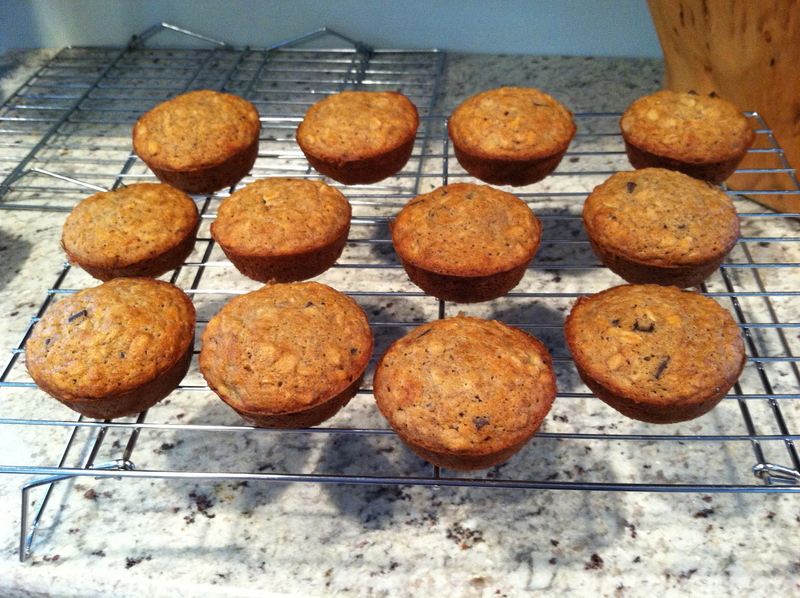 Pour into a greased muffin tin and bake for 20 minutes or until muffins are lightly browned and a knife inserted into the center comes out clean. Let cool and enjoy!